Our family had been talking about going to the Pez Museum in Burlingame, CA for a long time, so I finally made it happen as part of 40-4-Steve. While it was not at all what we expected, it did not disappoint. We loved seeing all the various Pez machines, advertisements, and other products, along with the other items on display. The gift shop was awesome. Of course, we HAD to buy every flavor of Pez that we'd never tried before (chocolate, cola, and four flavors of Sourz). Here we are, standing with the World's Largest Pez Machine. 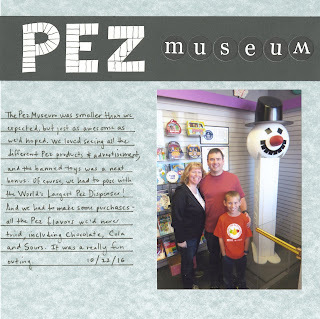 I'd recommend a visit to the Pez Museum if you find yourself in the South Bay with some time on your hands. I'd also recommend giving these unusual Pez flavors a try. I can't say that I loved them all, but it was great fun trying flavors besides the usual fruit ones! Oh wow. It must have been fun! How fun! I love that photo!!!!!!!!!!!!!!!!!! !